Banana cakes are so underrated!! They’re one of my favorite types of cake, but sadly I don’t make very often! I’ve made a few different banana cakes in the past, but wanted to do something different with this one. I recently tried Banoffee pie for the first time, and realized it would make the perfect cake flavor!! It’s made with a delicious soft toffee filling, bananas, and whipped cream. I’ve incorporated all of these elements into this cake! To speed up this process, make the “toffee filling” a day in advance!! Place the can on its side in a large pot. Fill the pot with water, making sure the water level is at least 2 inches above the can. Set pot over high heat and allow to come to a simmer. Reduce heat and simmer for 2 hours; check the pot every 30 minutes to ensure the water level stays above the can, adding boiling water as necessary to top it up. Carefully remove the can from the water using tongs or a large spoon, and set on a wire rack to FULLY cool to room temperature. It is very important that the can is fully cooled before opening, otherwise the can may explode due to the heat and pressure! The following day, make the banana cake layers. Preheat the oven to 350°F and grease and line four round 8 inch cake pans. Set aside. Mash the bananas (you can use a fork or a mixer for this) and set aside. Whisk the flour, baking powder, baking soda, and salt together. Set aside. Using a handheld or stand mixer fitted with a paddle attachment, beat the butter, granulated sugar, and brown sugar together on high speed until smooth (about 1 minute). Use a spatula to scrape the sides and bottom of the bowl as needed. Mix in the eggs, one at a time, then add the vanilla. Beat on medium speed until combined, then beat in the mashed bananas, and lemon juice. With the mixer on low speed, add the dry ingredients in three installments, alternating with the buttermilk and mixing each addition just until incorporated. Carefully fold in the mini chocolate chips. Do not overmix. The batter will be on the thick side, and there might be a few lumps of banana! Divide batter evenly between 4 pans. Bake for about 26 minutes, or until a toothpick inserted in the center comes out (relatively) clean. Remove the cakes from the oven and set on a wire rack. Allow to fully cool in the pan. Next, prepare the whipped vanilla buttercream. In the bowl of a stand mixer, beat the butter on a medium speed for 30 seconds with a whisk attachment, until smooth. Slowly add in the powdered sugar, 1 cup at a time. Alternate with small splashes of cream. Scrap the sides of the bowl with a spatula, to ensure all the powdered sugar is mixed in. Add in any remaining heavy cream, then whip on high for about 1 minute. Pour in the egg whites, and beat on high again for about 30 seconds. Add in the vanilla and salt, and mix until fully incorporated. The frosting should be rather thick, like whipped topping! Stack and frost layers on a 10 inch, grease-proof, cardboard cake round. 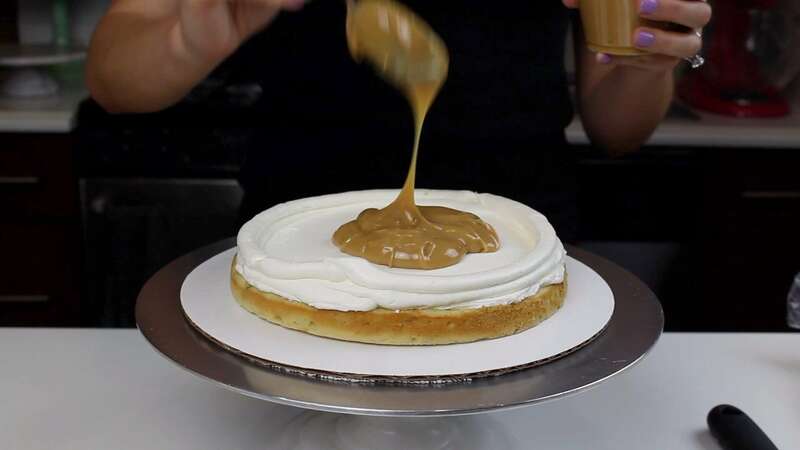 Frost a ring of whipped vanilla buttercream around the perimeter of the layer, and add a generous scoop of the toffee filling into the center of the layer. 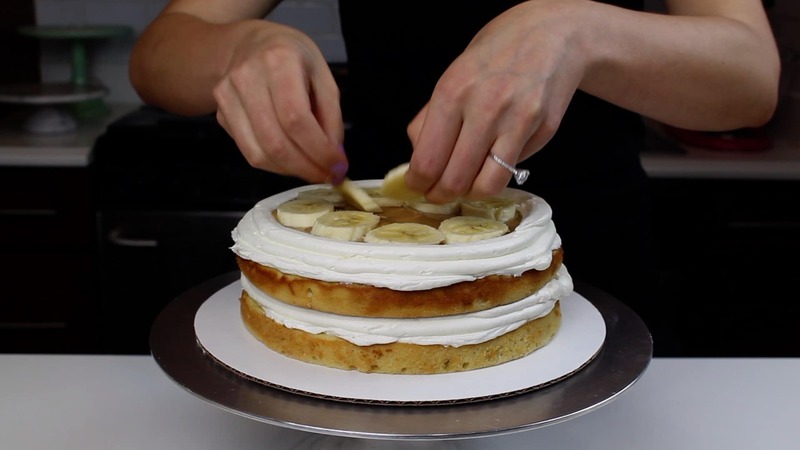 Spread evenly over the cake layer, and top with slices of fresh bananas. Repeat with remaining layers, being sure it the toffee filling and bananas stay within the frosting boarder. Cover the cake in a thin crumb coat with the vanilla frosting, and chill in the freezer or fridge for about 5 minutes. Once the crumb coat is firm to the touch, add a second layer of frosting. Smooth using a bench scraper. You can see a full tutorial on how to frost a cake with smooth sides here. 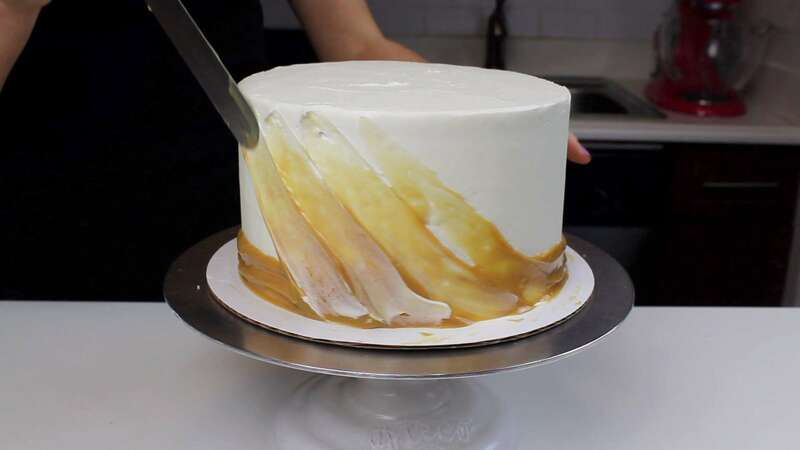 Once smooth, spread a thin ring of toffee around the base of the cake, and then use a large offset spatula to drag the toffee up the side of a cake. Try to keep the angle of each frosting drag the same, to give the cake a cohesive look. I ended up going around the cake twice, to really blend together all my toffee swoops. 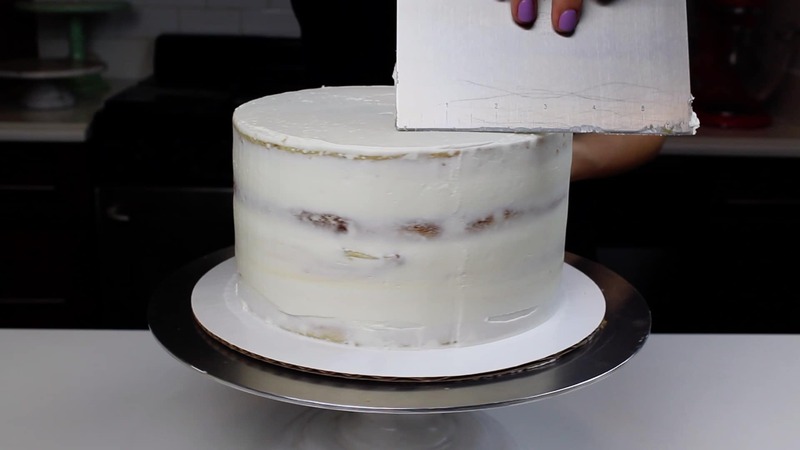 Once the sides of the cake are completed, smooth any over hanging frosting at the top of the cake into the center, using a bench scraper. Top the cake with a circle of freshly slice bananas, and a drizzle of warmed leftover toffee (I heated the toffee in the microwave for about 15 seconds). I’ve really been loving simple cake tops lately, so I was obsessed with the finished look of this cake. 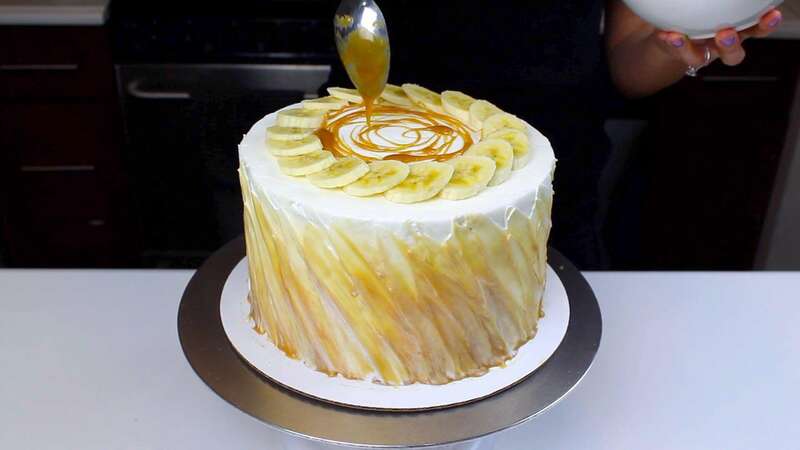 If you don’t plan to eat this cake immediately, the bananas on the top of the cake will brown! To trouble shoot, you can either brush the bananas with lemon juice to prevent browning, or use banana chips. 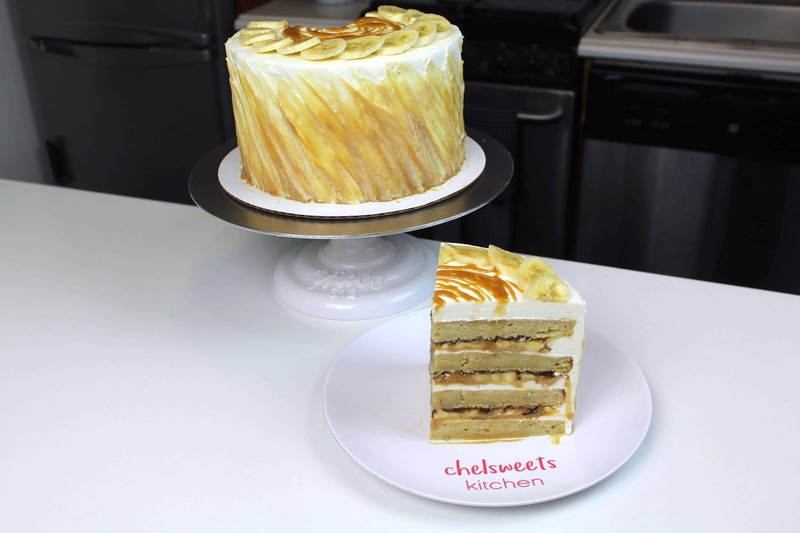 This cake is truly delicious, and such a fun spin on a banana cake!! just updated the recipe! you can disregard that part!! I love love your column and Instagram sites , ??? Can’t wait to make your banana cake shown here but am confused as to how much chocolate and type???? Please help me out here and keep on baking. ?? just updated the recipe! you can disregard that!! Looks like it didn’t update – chocolate is still in there. Also you mention vanilla twice – when does it get added? the recipe is now updated. just updated the recipe, you can ignore that part! Quick question! How long can you leave the whipped vanilla buttercream at room temp? Thanks! Are egg whites necessary to add to the vanilla buttercream? I’ve never added them to frosting unless it was sm buttercream. If I wanted to omit them would I just use more cream? Thank you, can’t wait to assemble and eat this tonight!!? Hi, I just love looking at your amazing cakes! Just would like to know if the whipped vanilla buttercream is too sweet? You’ve included 8 cups of icing sugar. Is there an alternative? Thanks! These cakes are amazing! I’ve got to ask, though…what do you do with them all after they’re made!?!? I bring them into work for my coworkers to eat! sadly I don’t so sorry!! Hi! I’m a huge banofee fan. One question, the bananas on top for decoration, won’t they turn black after sometime? you can brush them with a little banana juice to prevent browning! This looks amazing! Do you think I could make the same effect with chocolate ganache instead of dulce de leche for that angled finish!?? I think that would probably work too!! 🙂 I think that wold look awesome!! 3 1/4 cups of flour sounds a lot – is that correct? it also has three cups of sugar! this recipe makes a pretty large cake!